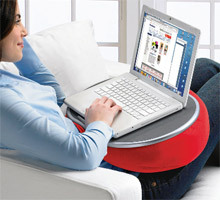 This lap desk will let them comfortably work on their laptop computer anywhere they like. It instantly transforms their couch, bed, or favorite chair into a comfortable workspace. Featuring a soft, angled design and just-right support for their laptop computer. This comfortable laptop desk will free you from your desk or dining room table, allowing you to work, email or surf the Web anywhere in your house. Soft padding lets our lap desks naturally conform to your contours. The laptop desk is cushioned to keep your lap cool and comfortable while you’re working. Perfect for catching up with email while watching TV, this lap desk also provides an ideal portable surface for reading or writing in bed. Plus, they come in 4 fun colors to match your mood or dÃ©cor. She won’t have to put forth a whole lot of style while saying hello in the ‘Callie’ sandal. These flip flops are super cute and are nice to have in hot weather and still want to be fashionable. Great amount of height. This stylish leather-trimmed wallet is the perfect way to stay organized. 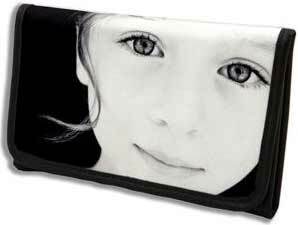 The tri-fold wallet features eight credit card slots, a zippered coin pouch as well as a place to hold bills and a checkbook. Put you friend’s or family member’s favorite picture and display it across the front. Find this and other personalized gifts at this store. You can’t go wrong with jewelry, all women love jewelry, so here is a great 2 Carat Diamond 10K Gold Tennis Bracelet. Twinkling diamonds, gleaming gold, and timeless design are combined for gorgeous effect in this elegant bracelet. You can get it at this online store.